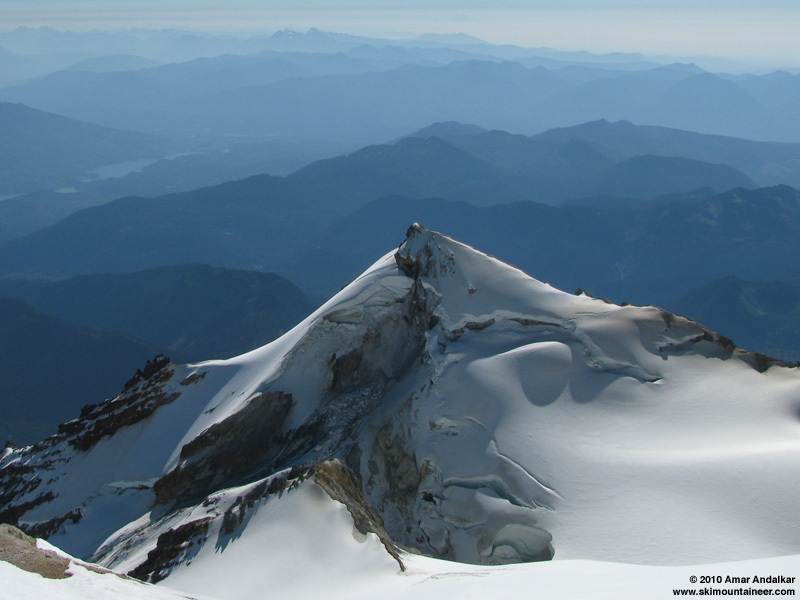 A new month, a new season, a familiar mountain . . .� Dave Coleman and I headed for the summit of Mount Baker once again for our first day of the 2010-2011 ski season. Lots of September snowfall at higher elevations, followed this week by several days of warm sunshine and 14000 ft freezing levels, had us hoping for smooth spring-like corn snow up high -- which was exactly what we would find! Shredding the corn on the Roman Wall, with Glacier Peak in the distance. 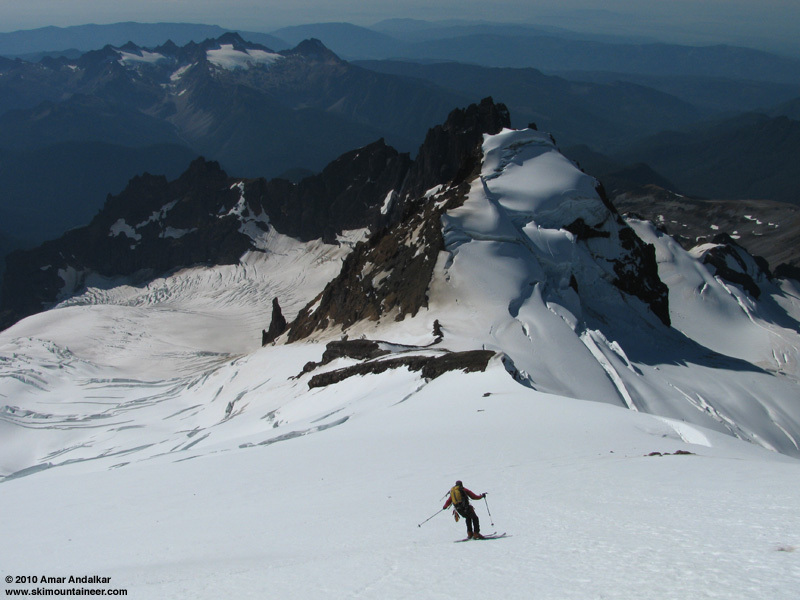 We initially considered the south side (Easton / Squak), but decided to give the northwesterly Coleman-Deming route a shot instead, based on recent reports showing nice skiing even down low on Heliotrope Ridge. A 6am start by headlamp and a slow trudge up the very wet and muddy trail brought us to Hogsback Camp and the glacier's edge at 6000 ft just before 8am, still cold and shadowed here despite a lovely sunrise and perfectly clear sky overhead. 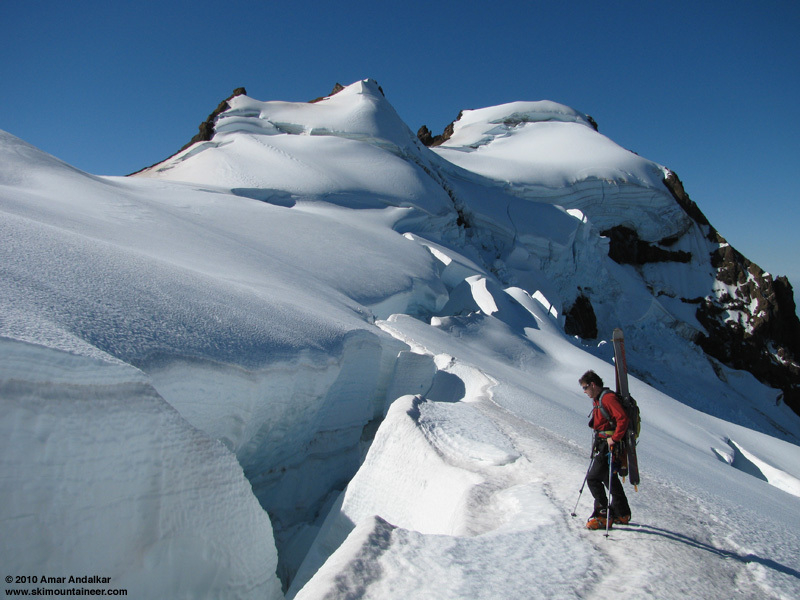 Firmly frozen snow forced cramponing on foot instead of skinning, and a view of numerous open crevasses encouraged us to don our harnesses and glacier gear, but the rope stayed in the pack, where it would remain all day. Lots of areas of bare blue ice on the lower glacier, but a continuous path of skiable snow still extends all the way to the toe (if you stay west of the nunatak near 6500 ft). Looking down on the Coleman Glacier, showing the path of continuous skiable snow just west (left) of the nunatak. Recently fallen snow remains only above 8000 ft, shining clean and smooth in contrast to the dirtier and rougher snow beneath. 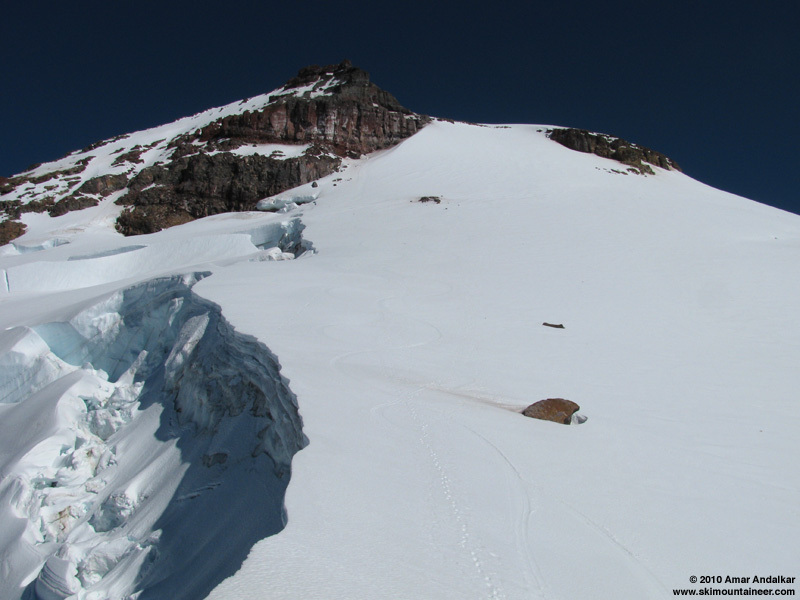 Despite numerous open crevasses all around, the route itself is in fine shape and not particularly hazardous, with nary a spot that called for the safety of the rope. 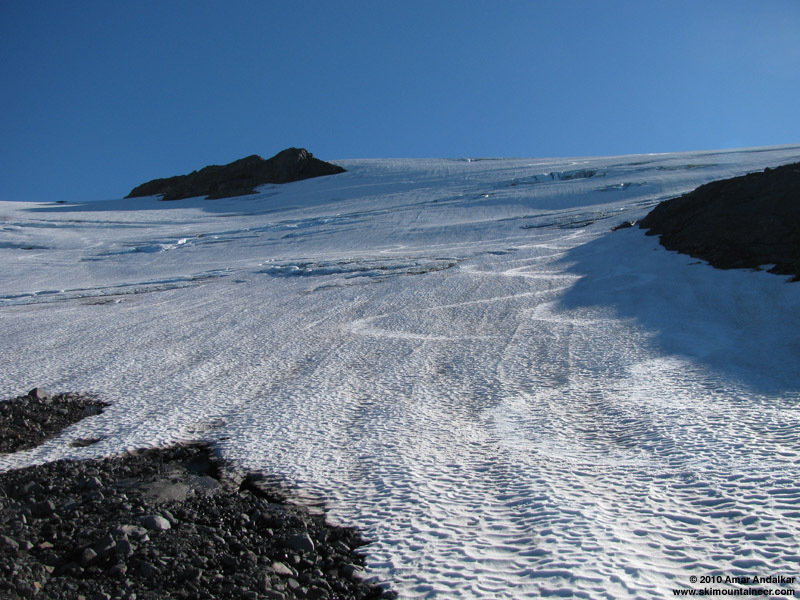 The main bergschrund near 8800 ft is open nearly the full width of the glacier, forcing a long traverse eastward (1/4 mile or so) to end-run it near the seracs and debris below the Roman Nose, but otherwise the route remains straightforward and direct. No other skiers today, and only one pair of climbers on foot, a quiet day on the mountain. Coleman gazing at the Coleman -- end running the bergschrund near 8800 ft.
A southerly wind gained force on the ridge above the Coleman-Deming saddle, gusting over 30 mph at times and tugging annoyingly at the skis on our packs. We'd put skins on the skis at the car, but with the firm conditions it never seemed worthwhile to start skinning and so we just kept cramponing on foot, making this the first backcountry ski trip since August 2009 (Slush Cup) on which I did not skin at all -- too bad, since skinning up is so much more elegant and fun than carrying the planks. But Dave kicked a nice set of switchbacking steps up the firm but quickly-softening corn of the Roman Wall, and we topped out on Grant Peak shortly after 1pm. Warm sunshine and temps near 40 �F, but a gusty wind which luckily was avoidable on the northerly lee slope of the peak. I took a few photos looking down the Boulder Glacier of a large debris-avalanche deposit from Sherman Peak, which occurred in early September (see this report). 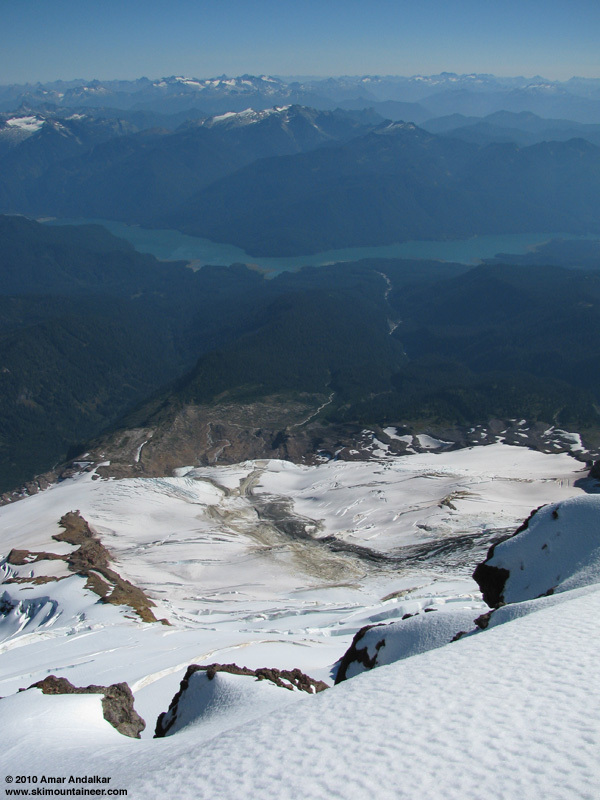 Looking down from the summit at the debris-avalanche deposit on the Boulder Glacier. The source of the debris avalanche on Sherman Peak. 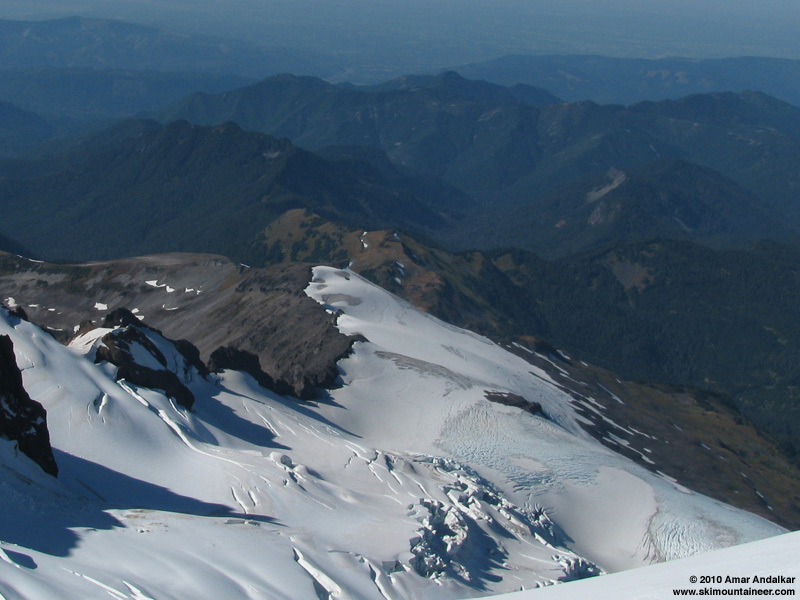 Skiable snow still extends to the summit register, but the sunshine and warmth is rapidly melting the new snow nearby. A quick traverse across the frozen corn of the summit dome, fighting the gusty headwind, brought us to the nicely softened SW slopes of the Roman Wall. Beautiful turns on smooth fast corn, as nice as you can hope for in October. Sweet turns on the Roman Wall, with Colfax Peak below. Ski tracks in smooth corn on the Roman Wall. The recent heat has melted out a large portion of the west ridge, and huge gaping crevasses and schrunds block any all-snow routes on both sides, so we were forced to take the skis off near 9300 ft and walk down the crumbly climbers' trail for about 80 vertical feet. Then back on snow for the rest of the way, a bit firm in spots on steeper northerly rolls, but otherwise mostly smooth and nice corn. More nice turns on the Coleman Glacier. Looking back up the Coleman Glacier from about 7000 ft.
A lightly rippled surface of older snow below 8000 ft, not as smooth but still nicely skiable and not bad at all. Then weaving through the cracks and blue ice sections on the lower glacier. 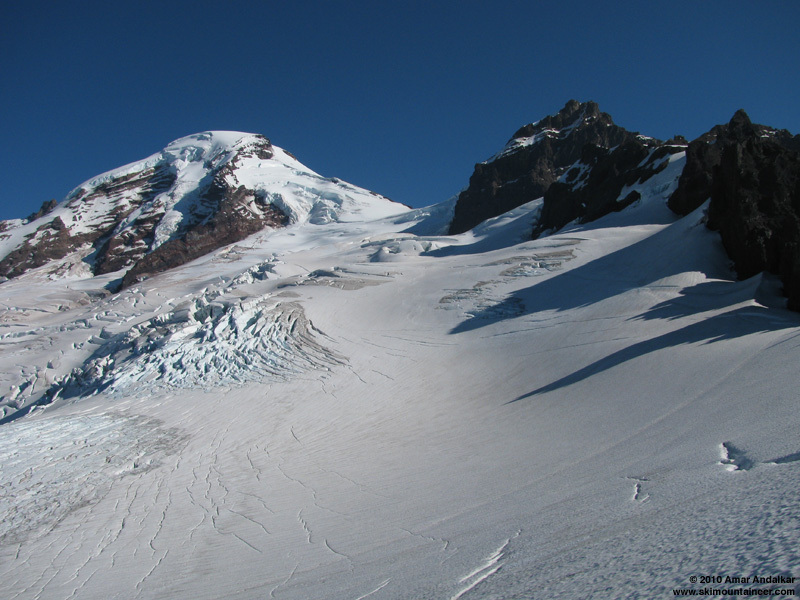 The final steep north-facing slope at the glacier toe was still a bit too firm, the oblique October sun could not soften this area even during the warmest time of day as 3pm neared. 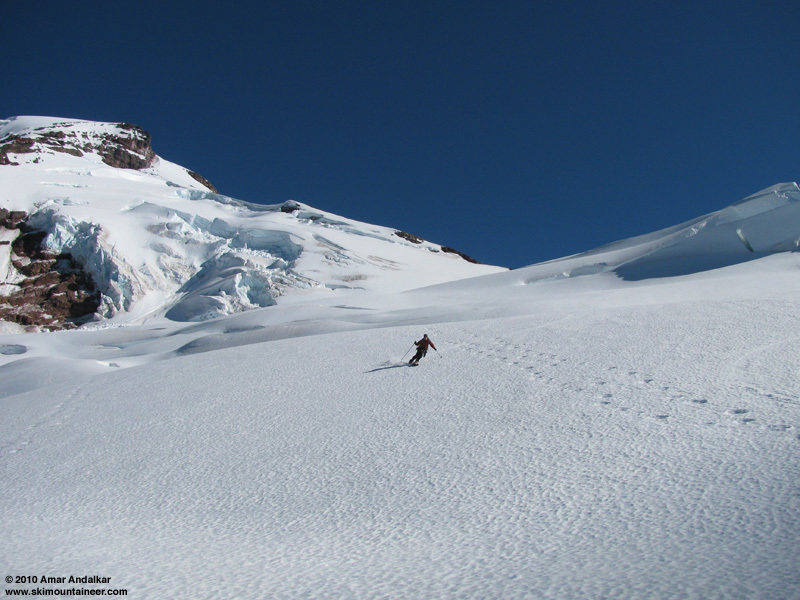 Final turns on the glacier toe down to 6000 ft.
A beautiful day on this great ice-covered volcano, with sun and warmth feeling more like September 1st than October 1st. 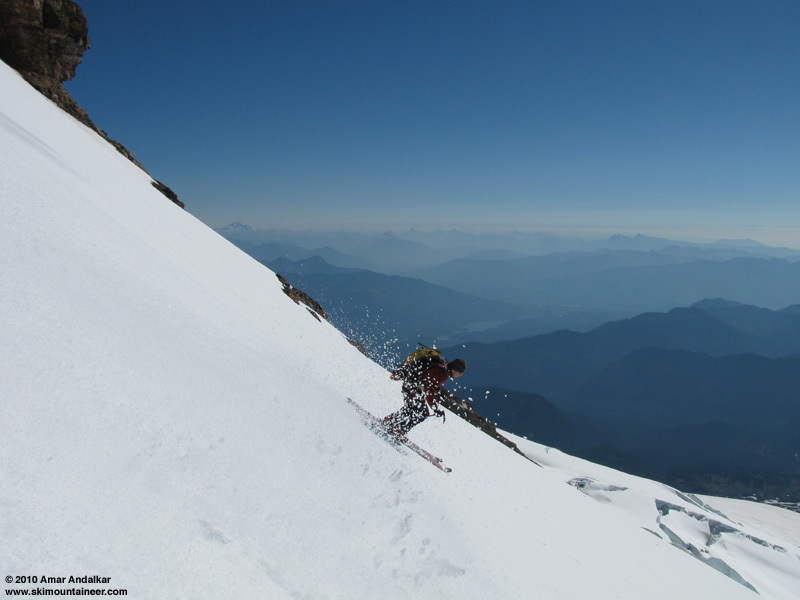 About 7400 ft of total gain for 4700 vert of mostly sweet turns, making my 10th ski descent of Mount Baker in 2010 (equaling my total for the previous 13 years), and also completing 9 years of turns-all-year, turns-every-month. 10 sumitts in one season.I thought I was obsessed with Baker with 4.Nice work.I wanted to get up there that day, but got lazy.